Review date: 7 February 2002. ATA133 - or Ultra DMA/133, or Ultra ATA/133, or any number of other names mainly made out of parts of these ones - is not a big deal, technically speaking. Neither was ATA100. Neither, really, was ATA66. All of these are ever-faster AT Attachment (ATA) drive transfer modes. ATA, commonly known as IDE, is the standard used by the vast majority of PC mass storage devices - hard drives, CD-ROM and DVD-ROM drives, and various other things. SCSI makes a strong showing for high-end computing, but in computers with four or fewer drives (not counting the floppy drive), that're used for ordinary desktop computer tasks, SCSI has no significant advantage and costs a lot more. So ATA, or IDE, it is. ATA66, 100 and 133 are ATA transfer modes with peak bandwidths of 66, 100 and 133 megabytes per second, respectively. To make the higher transfer rate possible, all three of these modes use 80-conductor cables with extra earth wires interleaved with the other conductors, versus the 40-conductor cables that are OK for ATA33 and slower. You can't actually move any ATA mode's whole peak bandwidth worth of user data down the cable, thanks to the usual overheads, inefficiencies, taxes, fees and deductions. You get about three quarters of the advertised bandwidth, tops. Or, to put it another way, you generally don't. You see, there exist practically no ATA drives that can fill even ATA66 bandwidth, by themselves. An ATA66-or-better drive can do it for the brief instant it takes to fill its write buffer or empty its read buffer, because the buffers are RAM and thus very fast. But the physical drive mechanisms are far, far slower, and the buffers are very small compared with the drive capacity. 2Mb is the biggest buffer you'll find on almost any ATA drive. The fastest PC hard drive in the world right now (probably still this one, unless I've missed a press release) has raw transfer rates varying from about 44 megabytes per second, for its inner tracks, to about 59 megabytes per second, for its outer ones. So, by itself, it could "saturate" - completely fill - the real user bandwidth of ATA66, more or less. But it's not going to, because it's SCSI. Even the most outrageous ATA drives currently in existence can only shift 29 to 49 megabytes per second, despite having much higher capacity than the fastest SCSIs, and thus moving more data under their heads per rotation. By itself, the above-linked Western Digital behemoth can saturate ATA66, but not if it's accessing its inner tracks. So ATA100 and ATA133 won't give you any significant benefit for a single drive. A weeny bit, measurable in benchmark programs, from faster access to the buffer; the above-linked drive has an 8Mb buffer and will benefit more than usual. But still not much, and that little will be all you get. And the Western Digital is a hyper-ultra-fast ATA drive. Sustained transfer rates more like 20 to 30Mb/s are more plausible for the drives in most recent PCs. The 100-gigabyte-plus humungo-drives that hold the ATA performance crown aren't quite mainstream yet. The reason for all this is simple enough - the super-fast SCSI drives spin at 10,000 to 15,000RPM depending on the model, while the fastest ATA drives only run at 7200RPM. Any faster than that and, problem the first, the drives will tend to run warm enough that they need their own forced air cooling, which they can't get in almost all PC cases. People who buy super-fast SCSI drives have to keep them happy with suitable air flow. And, problem the second, the performance of a theoretical 15,000RPM ATA drive would rival that of SCSI drives - as, quite likely, would its price for a given capacity, because the higher rotational speeds mean you need some fancier parts, and finer manufacturing tolerances. Market size accounts for some of the SCSI price premium, but mechanism quality is a factor too. 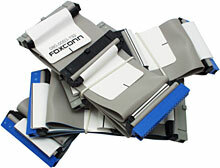 Hard drive companies want ATA devices to remain the mass market product and not poach their SCSI business. And, since drive speed has not much impact on the performance of home and office PCs, there's no reason at all to ramp up heat, noise and price to give consumers more of what they don't want. Consumers, though, are suckers for a bigger number. The 80-wire ATA modes definitely give them that. Few computer sellers are likely to go out of their way to mention that ATA100, in your standard PC system with one hard drive and one CD-ROM, will operate no faster than ATA66, and that even dropping to ATA33 is very likely to make no noticeable difference. Not that this is a huge scam, mind you. I don't think anybody's buying a new motherboard just to get the latest hot ATA mode. ATA66 took over smoothly from ATA33 as the standard motherboard fastest ATA mode (all of the older modes are still supported by newer controllers), and as the standard mode supported by drives as well; ATA100 has done the same thing, more recently. ATA133 is already in the motherboard market now - the Abit KR7A-RAID in my current PC supports it for two of its four IDE connectors - but it's not standard equipment for everything yet; give it a year and it will be, though. You get the faster ATA modes as a matter of course when you get a new motherboard, and they don't add anything significant to the price of boards or drives. So nobody's getting ripped off. Just don't expect anything special, for ordinary computing, from these potentially-faster modes. If you're actually using drives with 35MB/s average transfer rates, and you hang two of them off one IDE host interface (two drives is the most that you can hook up to one IDE connector - one master, one slave; IDE host interfaces normally have two connectors each for a four drive limit), then it's not out of the question that you'll occasionally be trying to shunt 70 megabytes per second around the place. And then ATA100 or even ATA133 may well give you better real world disk subsystem performance than ATA66, and certainly better performance than ATA33. Most people aren't going to be doing that often enough that there's any point worrying about it, but some people are. And those people are interested in RAID. RAID stands for Redundant Array of Independent Disks ("Inexpensive", not "Independent", originally; you still hear the old version here and there), and it lets you aggregate multiple physical drives into what looks, for all intents and purposes, like one storage device. It's basically the opposite of partitioning. The RAID modes (or "Levels") that matter in the low-ish end of the market are 0, 1, 3 and 5. RAID 0 is a non-redundant striped array. Data is striped over two or more drives so that when you write to them, the first one gets the first chunk of data, then the next contiguous chunk goes to the next drive, and so on, until the number of drives in the "stripe-set" is exhausted and the write returns to the first drive. The size of the stripes used is almost always configurable, and fiddling with it can have considerable effects on performance. 512Mb seems likely to be the optimal stripe size for IDE RAID controllers. RAID 0, essentially, arithmetically adds the sustained transfer performance numbers of the drives in the stripe-set, if it's implemented by fast gear and not done in software, which the server versions of Windows and other Serious Operating Systems can do. But if any drive in the stripe-set dies, you lose the data that was on it. For most practical purposes, the failure of any one drive will bork all of your data, since the data loss will be evenly spread through all of the RAID array's contents. A two drive RAID array has twice the probability of failure of either of the drives in it. If you're thinking that this behaviour makes RAID 0 undeserving of that "Redundant" at the beginning of the RAID acronym, you're exactly right. RAID 1 is mirroring. Every drive has a mirror drive, which duplicates its entire contents. You only get to use half of the aggregate capacity of the drives in your array - two 40GB drives give you a 40Gb RAID 1 array - and there's no speed benefit, if you're using consumer-level controllers (pro controllers can do two reads at a time from a mirror set, doubling read speed). But a drive and its mirror both have to die for you to lose data, which is very unlikely unless something nasty of an outside-the-drives nature happens. Fancier RAID 1 controllers let you designate drives as "hot spares", to automatically be brought into service if a disk fails. This will severely degrade array performance while the contents of the drive that's lost its mirror are copied to the new mirror drive, unless the controller's very clever about doing it and happy about the job taking rather a while. But at least it's an unattended process. Another feature of better RAID 1 controllers is "hot swap", which lets you remove and replace a dead drive without shutting down the system. The new drive will, again, automatically have its twin copied onto it. Simpler controllers without hot-anything require the computer to be shut down for dead drives to be swapped out, and the computer stays offline while the re-mirroring happens. RAID 0+1 is mirroring of a stripe-set. The simplest possible RAID 0+1 array has four drives - a pair of two-drive stripe-sets, mirrored onto each other. RAID 0+1, as implemented by consumer IDE RAID controllers, is a hair slower than plain RAID 0. But it fixes the many-single-points-of-failure problem; a four drive RAID 0+1 array has to lose at least one drive and its mirror for data loss to occur. This is two times as likely to happen to the four drive array than to a plain two drive mirror, but the chance of it happening thanks to genuine drive failure (as opposed to drives being zapped by a faulty PSU, smashed when the computer's knocked off a table, stolen, burned in a housefire...) is still very small. RAID 3 is a stripe-set with parity. There's one extra drive for each pair of regular data storage drives in the array, and that extra drive stores parity data - the difference between the data on those two drives. Lose the parity drive and you've still got the data drives; no problem. Lose either data drive and the remaining one, plus the data on the parity drive, gives you enough information to rebuild it. Lose any two drives and you're sunk. But this is, again, unlikely, so you get data protection, and two-thirds of the aggregate capacity of the drives in the array. RAID 5 is the same as RAID 3, except that all of the data, including parity, is striped across all of the drives. It makes reads faster than RAID 3, but writes slower. All of the hot-swap and hot-spare stuff applies to RAID 0+1 controllers; better ones have it, cheaper ones don't. Pretty much any RAID 3 or 5-capable controller should have hot-everything support. But consumer RAID controllers don't support RAID 3 or 5 at all, because you need quite a bit of computing power to work out the parity data on the fly. Expensive pro RAID controllers have that power, and pure software RAID implementations can just make the CPU do it, but the performance hit from calculating all that parity data is large. Until recently, the only consumer IDE RAID controllers available have all been much the same in their basic capabilities. They support whatever the fastest ATA mode of the time is, they have two IDE connectors, they support RAID 0, 1 and 0+1 on a maximum of four drives. Not especially capable, but dirt cheap, included on many motherboards, and perfectly capable of just running four separate drives, with no RAID tomfoolery at all. One of the most recent such controllers is the one that runs the second pair of IDE connectors on my KR7A-RAID, and gives them ATA133 compatibility. It's a HighPoint Technologies HPT372, and it's a mild wax-and-polish update to the ATA100-capable HPT370, which is still on various current-model motherboards. 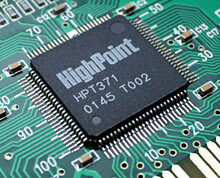 Highpoint have two new ATA133-capable controller cards out now. One of them's the simplest little IDE controller I've ever seen; one of them's the most complex consumer IDE RAID board I've looked at, and a real candidate for quite serious RAID applications. Let's look at the baby first. Want ATA133 compatibility? Want no more than two drives? Don't want anything else? 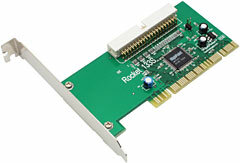 The HPT371 chip on this little card powers one, count it, one ATA133-capable IDE connector, into which you can plug two drives with the supplied 80-wire cable. This card doesn't just speak ATA133; it'll also work with drives with capacities above "137Gb". Or 128Gb, once you hang the 137Gb number from a tree and beat the marketing out of it with a rake. The size limit is an artefact of the original ATA design, which uses 28 bit addressing for the sectors on a drive. Two to the power of 28 is 268,435,456; at 512 bytes of data per sector, that's 137,438,953,472 bytes, maximum. You can't have any more sectors on an old-style ATA drive. This isn't 137Gb, of course. A kilobyte is 1024 bytes, a megabyte is 1024 kilobytes, a gigabyte is 1024 megabytes, so 137,438,953,472 bytes is actually precisely 128 gigabytes, right on the nose. But if you're a hard drive manufacturer, you specify everything in nice round powers of ten, because that makes drives look bigger. Hence, the frequent references to the limit being "a bit more than 137Gb", which confuse the heck out of people who thought it all started with powers of two, which wouldn't leave you with such a weird number at the end of the address space. There are other prefixes that people are allegedly meant to use when they're talking about base-two numbers (kibibyte, mebibyte, gibibyte...), but, rounded off to the nearest thousand, nobody does. Probably because the binary prefixes sound like baby talk. Plug your "137Gb" drive into your PC and format it and you'll get 128Gb capacity, less a per cent or three for the formatting overhead. And that capacity will be listed in megabytes. The new (and breathtakingly creatively named) "Big Drive" standard pumps the address space up to 48 bits. Which the marketroids want us to believe allows "144 petabyte (Pb)" drives. A petabyte (or, more correctly, pebibyte... "Who's a cute liddle pebibyte? You're a cute liddle pebibyte. Yes you are! YES YOU ARE! Tickle tickle tickle...!") is two to the power of 50, or (deep breath) 1,125,899,906,842,624 bytes. Drive manufacturers' petabytes are, of course, ten to the power of 15, or 1,000,000,000,000,000 bytes, so the new limit is now "144-and-a-bit petabytes". 144-and-a-bit Pb in marketing terms is, whaddaya know, exactly 128 real Pb. This binary/decimal storage rip-off factor gets worse and worse as the storage devices get bigger; every time you add another comma to the capacity number you add another 2.4% to the capacity overstatement. So they'd better have straightened this mess out by the time we're dealing with gigaquads. I don't know whether I hate the marketing people more for the fact that they've created all this confusion, or for the fact that almost every time I talk about storage devices, I have to write at least a couple of paragraphs explaining why the things don't actually have the capacity that's on the label. ANYway, the Rocket 133S works fine with drives of unreasonable size, provided they don't make your motherboard or operating system have a seizure, and that shouldn't be a problem with any somewhat recent PC. The HPT371 driver page doesn't have Linux drivers up yet, but users of all Windows flavours should be fine. If you want a controller that can accept two arbitrarily speedy brand new ATA133 devices and let 'em both pump away at full speed, this looks like a fine option. And if you want the luxury of two ATA133 sockets, but still don't need RAID, there's a two-socket Rocket 133, too. There are Price Watch listings for both cards already, listing the 133 for less than $US40 ex shipping, and the 133S for less than $US30. Update: Here in Australia, you can now get the RocketRAID 133, the RAID-capable version of the twin-port 133, from Aus PC Market for $AU181.50 delivered. Aussie shoppers can click here to go to the Aus PC site and order! Simple, straightforward, plug-and-go, cheap. You'll know if you want it. 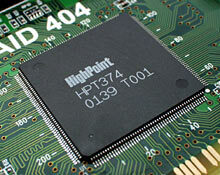 Four "Big Drive" ATA133-capable IDE sockets adorn HighPoint's latest RAID card; each can support the usual two drives. The 404, despite its somewhat ominous name, raises the bar considerably compared with earlier efforts in this market sector. It's similar in some respects; it still supports RAID 0, 1 and 0+1 only. Plus JBOD (Just A Bunch Of Disks - seriously), which connects drives end-to-end with no special RAID functionality, but gives you one apparently contiguous storage area. But the 404's got some new and exciting features besides its eight drive capability, and it lists for $US150. Price Watch surfers can find it for less than $US100, ex shipping. Less than $US75, from the bottom-feeders who may or may not be offering as much of a bargain as they suggest. Update: Aus PC Market now stock the 404, as well. It's $AU269.50, delivered. Aussie shoppers can click here to go to the Aus PC site and order! ...and four quality 80-wire IDE cables. The card also has a pin header block that lets you plug in four drive LEDs, if your case has them - one for each channel. Plug eight drives into the RocketRAID 404 and you can designate two to eight of them as a stripe-set, and any even number of them as mirror-sets, and combine the two as well. So you can have two four-drive stripe-sets mirrored onto each other. You also, importantly, get hot-spare and hot-swap. The 404's hot-spare function lets you designate arbitrary drives to be called into play if any other drive fails. All built in and automatic, nothing more to buy. The hot-swap function requires hot-swap-compatible IDE drive cradles to be installed in the computer; you can't just be yanking internal drives out with the computer running. Hot-swap cradles make soothing IDE noises even when there's no drive in them, and the RocketRAID package handles rebuilding the array on a swapped-out drive at a higher level. HighPoint have their own compatible "Rocket Mate" racks, and there are various others on the market. You set all of this up either with HighPoint's normal press-Control-H-during-startup configuration utility, which is easy enough to use, or via a Windows program that makes array configuration a bit more graphical. When any drama that requires a spare or a swap happens, the RocketRAID uses an on-board alarm beeper to tell you something's amiss. The beeper was still covered by a "REMOVE SEAL AFTER WASHING" manufacturing sticker on the board I got for review; if you want it to make a noticeable noise, you'll need to peel that off. The Windows support software has plenty to say when Stuff Goes Wrong, too, and can automatically send warning e-mail to an administrator. In the speed department, the RocketRAID 404 seems, according to its spec sheet, to be a breaker of records and a frightener of small children. HighPoint quote the RocketRAID 404's aggregate peak bandwidth as being "133Mb/s times four", because of its four IDE channels. They also point out that much more expensive Ultra160 SCSI solutions can shift only 160 megabytes per second peak, and they leave the consumer to work out for him or herself that this adds up to more than a factor-of-three win for the RocketRAID. Standard 32 bit 33MHz PCI - which is what the RocketRAID 404, and all normal PC motherboards, use - has the same inherent bandwidth as one ATA133 channel. 32 bits is four bytes; four bytes 33-and-a-third-million times a second is 133 megabytes per second. PCI, as usual, has less real-world bandwidth than this, but so does ATA133, so it pretty much evens out. What this means is that the RocketRAID 404 can be moving a million zillion fajillion megabytes per second to and from its drives, but there's no way it'll be shifting data to or from any other part of the computer at more than (roughly) single ATA133 channel speed. A 33MHz 32 bit PCI Ultra160 SCSI controller can't do it, either. You canna change the laws o' physics. How much throughput the 404 will actually be able to manage will be determined by how many other devices are yammering away on the PCI bus when the RocketRAID wants to talk. In a pure server, that shouldn't be a serious problem, and in many other RAID applications, like video editing, the only other PCI gadget that's doing much ought to be whatever's generating or accepting the hard drive data. It's part of the conversation, not trying to get a word in edgeways. But the suggested 533 megabytes per second, or even a more realistic 400, ain't gonna happen, by a long shot. The maximum sustained transfer rate that a regular two-connector ATA100 RAID controller with just two decently fast striped drives, accessing their outer tracks, can possibly manage, is around the 70 megabytes per second mark; maybe a bit more. Upgrade to ATA133 in this situation and you'll probably see a quite significant performance increase, for outer track accesses. Not the full hundred-odd user-data megabytes per second that ATA133 can deliver and plain PCI can accept, but most of it, if you're using monster drives with near-50Mb/s outer track transfer rates, and if your PCI bus has little other traffic. 10% improvement wouldn't surprise me, and that's enough to matter for disk-thrashing server purposes. Switching to a four drive stripe-set won't change the system's peak performance in ATA100 mode, since all of the interface bandwidth can already be used by two drives. But it will bring the array's minimum performance up to about the same full-bandwidth mark, because even the slower inner tracks can saturate ATA100 when you've got four drives going at it. Upgrade to ATA133 for this array and you'll get a bit more headroom with fast drives, but PCI speed becomes the limiting factor before ATA133 can help you much. Four mere 25Mb/s drives will neatly fit the real available bandwidth of PCI, and you won't need ATA133 to get that out of them. It doesn't hurt to have it, though. The RocketRAID 404 will let you run your four drive stripe-set, and it'll let you have another four drive set mirroring that stripe-set, for data security. That's the big feature here. All of this super-speed talk matters not at all if you're doing normal desktop computer tasks. Even if you double your overall disk subsystem speed - which you're not at all likely to, for the access patterns that desktop computers typically perform - the effect that'll have on total system performance isn't necessarily going to be detectable without running benchmarks. Mirroring is still perfectly sensible for data protection, and using RAID to get really big contiguous storage blocks is a valid aim too, but don't expect Microsoft Office or Tribes 2 to suddenly accelerate to Warp 9. Similarly, if you're building a file server connected to a normal 100BaseT Local Area Network (LAN), lightning-fast RAID probably won't have much of an impact. On a 100BaseT network connection, you're never going to be moving more than about seven megabytes per second of user data. This can still be a hellish drive load, if there are squillions of little files being accessed, or database tasks being done that also require lots of drive flogging but little data output. But a simple business file server equipped with just one 100BaseT network adapter will almost certainly have the load taken off its storage subsystem by the slowness of the network input/output. Gigabit Ethernet, however, is no longer just for the rich kids. You can get a switch with a single gigabit port and several 100BaseT ports (I review such an item here) for quite reasonable prices nowadays, and that'll let multiple 100BaseT clients access one server at once, each one sucking out its own 7Mb/s. Eight ports worth of 100 megabit leeching adds up to around 56Mb/s. You're not going to be able to move much more than that over gigabit Ethernet, but it's enough of a load, once you take a bit of server-side processing into account too, that ATA100/ATA133 storage bandwidth becomes good for something again. If you're not interested in RAID, by the way, the RocketRAID 404 works fine with up to eight separate drives connected. Pro RAID controllers don't do single drive modes; if you want that, you buy a non-RAID controller that costs a lot less. But consumer RAID controllers all work fine with separate drives; that's their default behaviour, if you leave their setup utility completely alone. If you need to build a CD-ROM jukebox or some similar polydriveular device, the 404's actually quite good value, even if you never use the RAID functions at all. Particularly if you have only one spare PCI slot. The RocketRAID 404 won't help if you don't have sufficient spare system resources to install two new IDE adapters, though, because it looks to the computer like two disk controllers. There's not a great deal that can be said about the Rocket 133 and 133S. They're just the next logical step in the basic add-on IDE controller market, they're well priced, and they get the job done. What's not to like. The RocketRAID 404, on the other hand, is the step up that consumer RAID needed. If you want true mondo bandwidth, you still need at least 64 bit 33MHz PCI (256 megabyte per second peak bandwidth) and a RAID controller card to match, and you'd prefer 64 bit 66MHz PCI (512Mb/s peak), and a still fancier RAID card to match. Now you're talking Real Man's Server Hardware, which is not something that's going to come for free in cereal packets any time soon. You can get server motherboards with a couple of 64 bit 66MHz slots on them for only about twice the price of a normal consumer board, but RAID cards to suit them, and SCSI drives to suit them, are what'll break the bank. 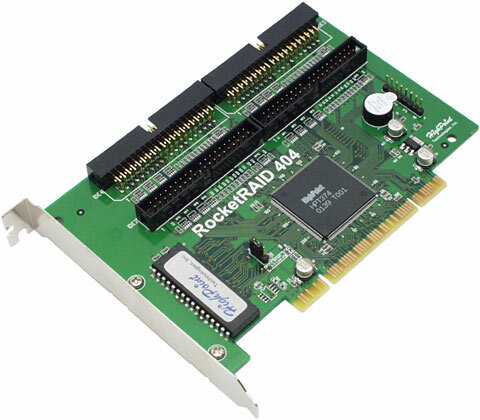 Within its limitations, though, the RocketRAID 404 should very nicely fit the needs of quite a lot of people, who really just need a cheap IDE RAID controller but with more drives, hot-swap and/or hot-spare. That's what you get with this card, and the price is great. Heck, the thing's worth buying even if all you need are four non-RAID IDE connectors! The vast majority of PC users are more than adequately served by the four-drive capacity of any old motherboard. If you're not one of those users, though, the RocketRAID 404 could well be for you. Rocket 133S and RocketRAID 404 kindly provided by HighPoint Technologies. Aus PC Market no longer stocks these cards, but they've got plenty of others! Overclockers Australia compare the Rocket 404 with Promise's FastTrak TX/4 controller, here.